Juvenile delinquency - Fiction., Homeless persons - Fiction., Friendship - Fiction. Stanley Yelnats is under a curse. A curse that began with his no-good-dirty-rotten-pig-stealing-great-great-grandfather and has since followed generations of Yelnats. Now Stanley has been unjustly sent to a boys' detention center, Camp Green Lake, where the warden makes the boys build character by spending all day, every day, digging holes: five feet wide and five feet deep. It doesn't take long for Stanley to realize there's more than character improvement going on at Camp Green Lake. The boys are digging holes because the warden is looking for something. 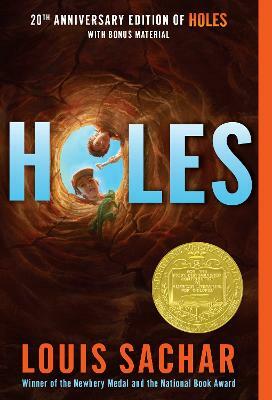 Stanley tries to dig up the truth in this inventive and darkly humorous tale of crime and punishment--and redemption. Louis Sachar is the author of the #1 New York Times bestseller Holes, which won the Newbery Medal, the National Book Award, and the Christopher Award, as well as Stanley Yelnats' Survival to Camp Green Lake; Small Steps, winner of the Schneider Family Book Award; and The Cardturner, a Publishers Weekly Best Book, a Parents' Choice Gold Award recipient, and an ALA-YALSA Best Fiction for Young Adults Book. His books for younger readers include There's a Boy in the Girls' Bathroom, The Boy Who Lost His Face, Dogs Don't Tell Jokes, and the Marvin Redpost series, among many others.